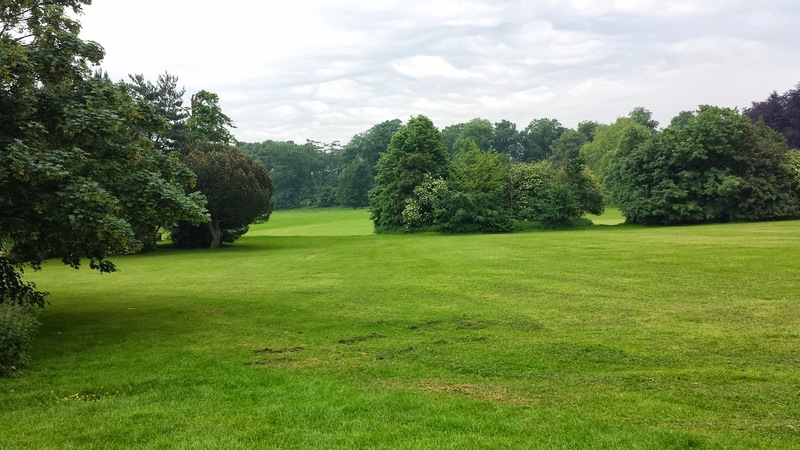 From around 20 BC until shortly after the Roman invasion of AD 43 the settlement of Verlamion occupied the land which is now the park that is home to St Albans parkrun. This was among the first places in Britain to be recorded by name. 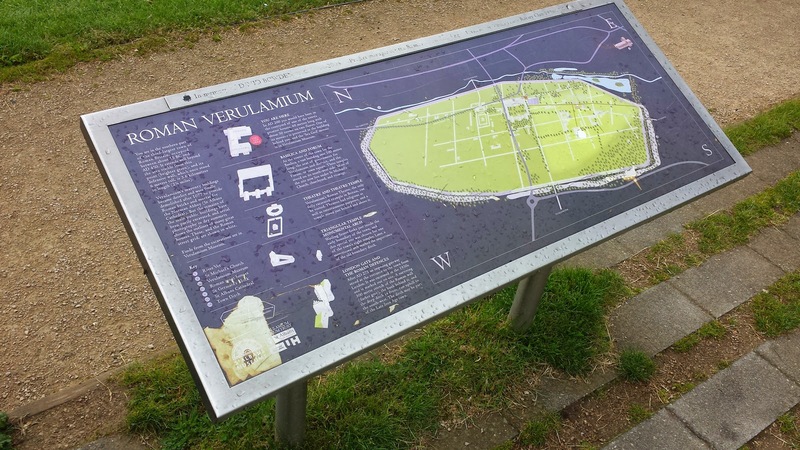 Later, in Roman times, the settlement had become the ancient town of Verulamium - the second largest town in Roman Britain after Londinium and this is where the park gets its name. St Albans itself took its name from Alban, who was beheaded by the Romans some time before AD 324, and became the first British Christian martyr. 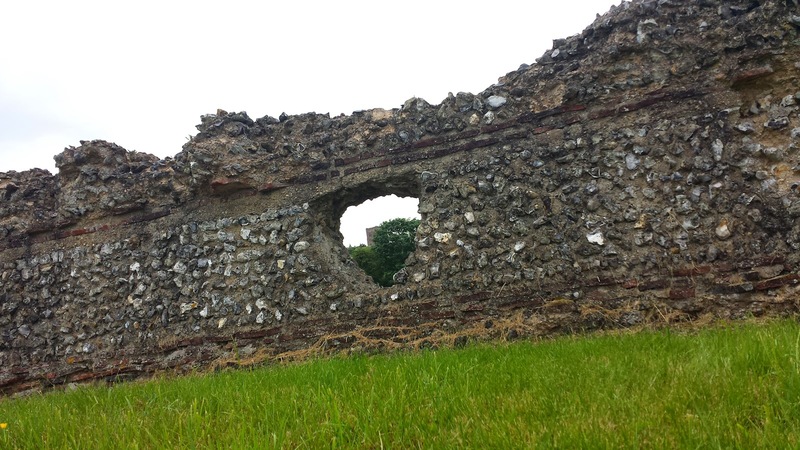 The picturesque 100 acre park contains traces of its Roman past and upon arrival you can park at the Verulamium museum. The timings of operation of the car park can seem a little confusing; from what I can work out the parking charges start from 9.30am and the minimum fee is £1.50, which covers for up to three hours. So in theory it is possible to park, run, and then leave before the charges come into effect. I just paid the £1.50 because I didn't want to rush off straight after finishing. The toilets are adjacent to the car park, as are a small set of bicycle racks. The closest mainline train station is St Albans Abbey, which is to the south east of the park. There is another train station (St Albans City) which is a little further away from the park. When I visited, the run took place on the standard course, but they do have an alternative cross-country course which can be used when ice makes the tarmac paths too dangerous to run on. The parkrun start/finish area is right next to the car park and after the run briefing, the runners are sent off to get their parkrun fix of the week. The course is pretty close to being flat (more about that later) and is all on tarmac apart from the finish line. 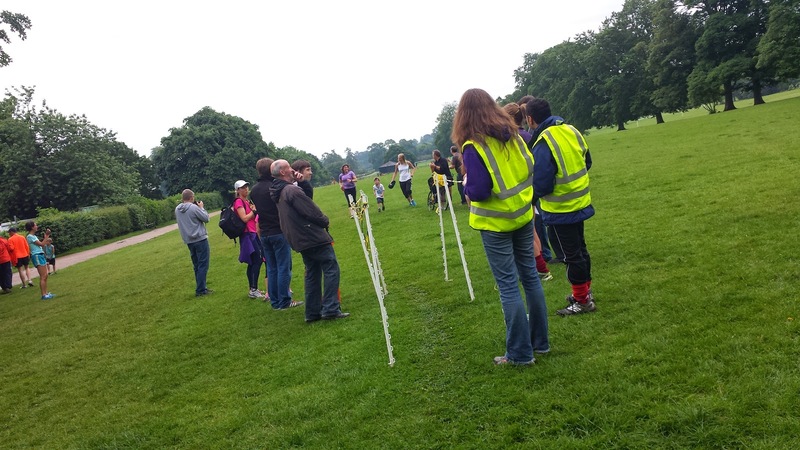 Road shoes are the order of the day and buggy runners will have no trouble whatsoever on the course. It is a very fast course. At the start, the runners spread out onto the grass making the start line very wide. This is very handy as it allows the runners enough space to filter into an appropriate position before joining the footpath. This opening stretch is a 600 metre long path that leads right through the centre of the park, passing a children's playground, tennis courts, Adizone and beach volleyball courts. On the way out I noticed that the gradient drops ever-so-slightly. At the end of the main path, the runners take a left hand turn and head towards the lake of which they must now complete three anti-clockwise laps, and as the laps progress there is lots of interaction between the runners as the faster crowd start lapping those further down the field. The lake is ornamental and was constructed in 1929, providing much needed work to the unemployed during the depression. The lake is fed by the River Ver. As the runners make their way along the eastern bank of the lake, they have the lake to their left and the river to their right, which I really liked. Towards the northern end of the lake is an ornamental bridge which effectively splits the lake in two. Members of the public are allowed to use the smaller of the two to sail model boats. 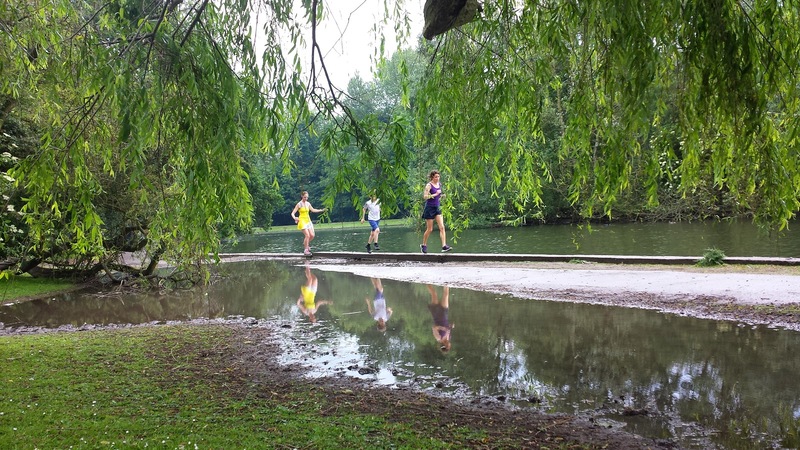 As the runners round the far end of the lake, the path narrows slightly and care is required to ensure that a foot doesn't accidentally go into the lake. 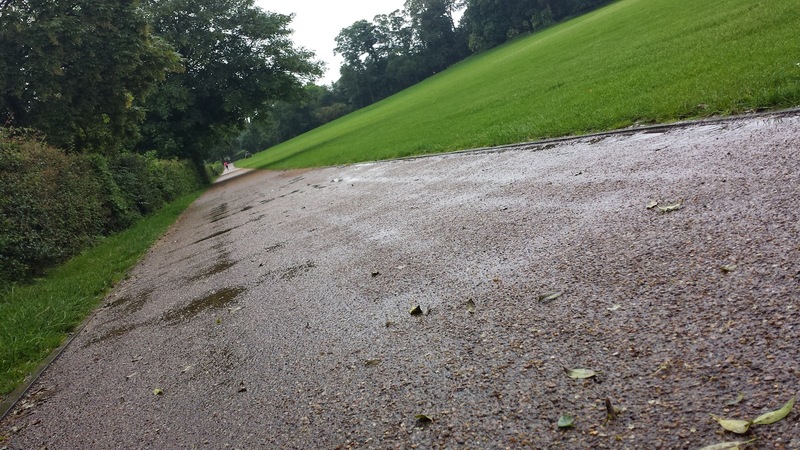 Further along, this path was flooded; some runners went onto the grass, some onto the slightly raised area adjacent to the lake, but the rest of the runners all just splashed through. It wasn't actually deep at all, so my feet remained completely dry (Update: I understand that this section had some work done on it and may possibly be less liable to flooding in future). Just before completing a full lap of the lake, to the runners' right hand side is 'St Germain's Block', which is a small stretch of the defensive Roman wall that originally stood 6 metres tall and was 3.6 kilometres in length. It is thought that it may have been part of the medieval chapel of St. Germain, hence its name. Looking to the east the runners get a nice view of St Albans Cathedral - the cathedral is reputed to stand on the spot where Alban was executed. 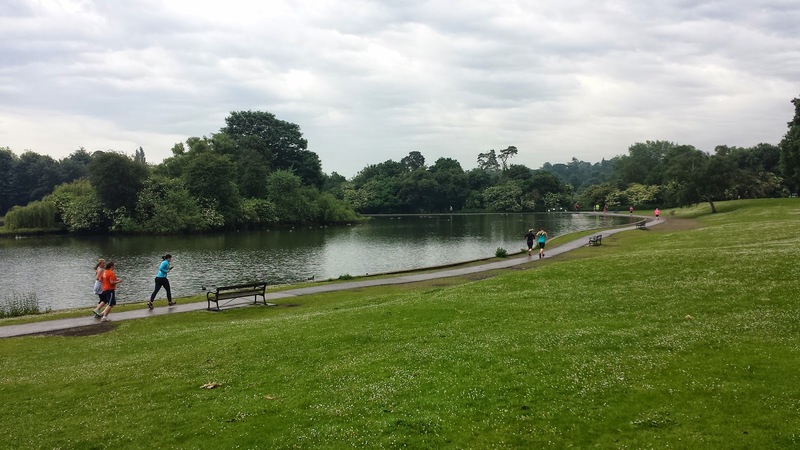 Once all three laps of the lake have been completed, the runners leave the lake area and head back along the central path, which now rises ever-so-slightly - it's barely noticeable when you are walking around but at the end of a hard 5k run it is. The finish line is found on the grass in pretty much the same place as the start line. Finishing tokens and personal barcodes are then scanned right next to the finish line (or under the tree if it's raining). 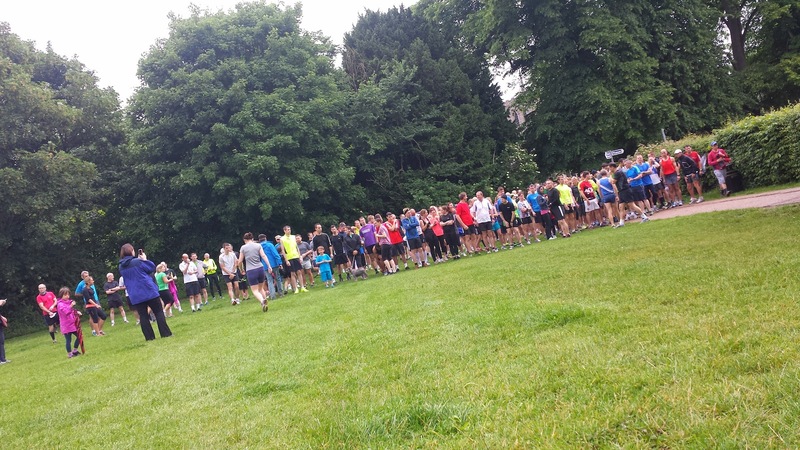 This venue attracts a decent amount of runners and even though it was raining, 203 turned up on the day I visited. After the run, it is definitely worth exploring the park and surrounding area - especially if Roman history interests you. I took the opportunity to have a look at the Roman mosaic and hypocaust, which was discovered in 1930s and is now protected from the elements by a purpose-built building. There is also the Verulamuim Museum and nearby is the remains of the Roman theatre. I feel that I've only just scratched the surface of this very interesting place. 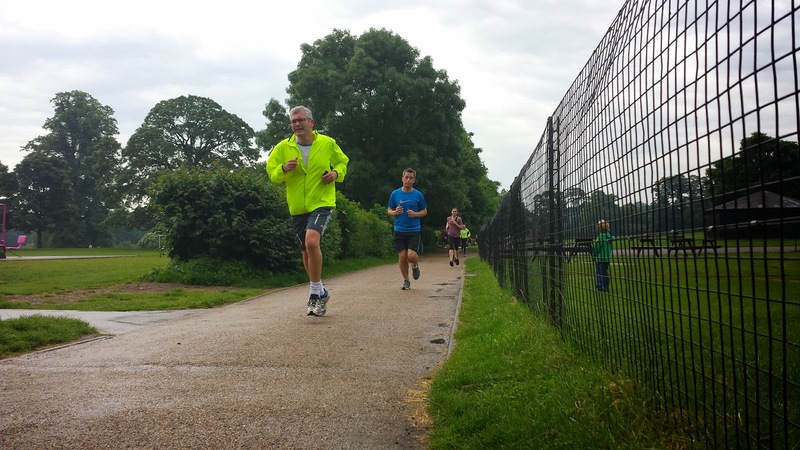 Oh, yeah.. the parkrun wasn't bad either!